A must-have versatile piece of camping and caravanning equipment also perfect for using in the home and garden. Set outside to give extra seating next to your motorhome, caravan and tent or set-up in the garden for that summer barbeque or family gathering. 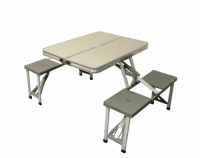 The portable tables are perfect for popping in the garden and can easily be stored away to free up space. Pop the portable picnic sets or tables in the boot of the car and set up in a country park for the perfect day trip. 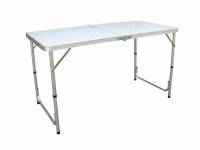 You will find these camping tables and picnic sets will be used time and time again not just on your holiday but in the garden and on day trips too.